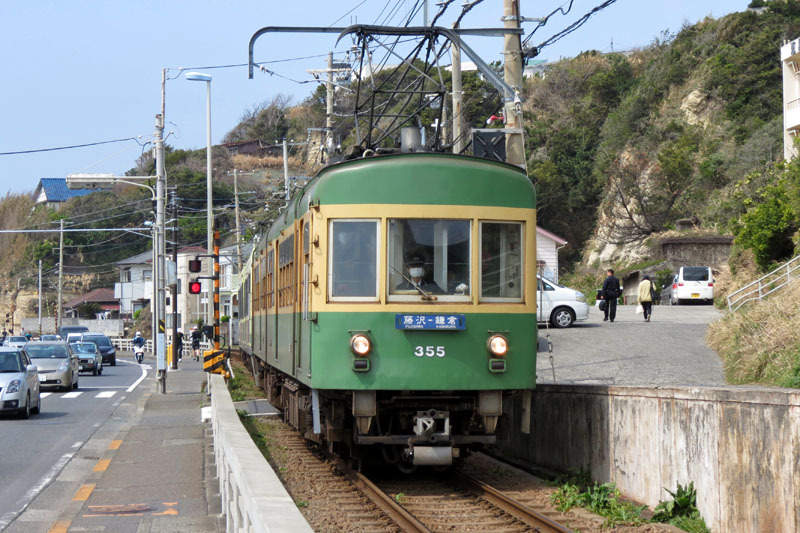 Enoden Line [江ノ電] is the most useful transportation that links Fujisawa [藤沢] and historical city Kamakura [鎌倉] via Enoshima. Most of major tourist spots in the area are located along the line. 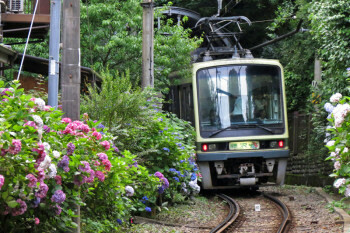 It is known for variegated landscape and keeping atmosphere of nostalgic railway, among 15 stations on 10km, 30minutes trip. 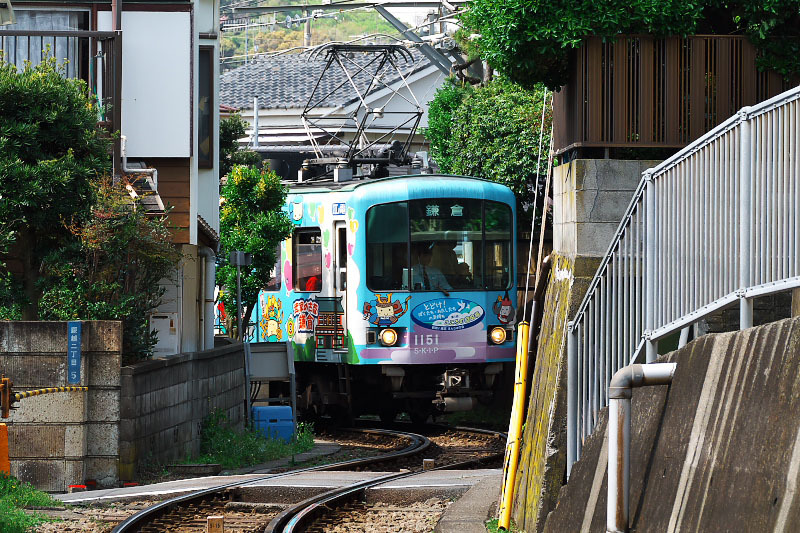 This tiny railway in Japan is also known for appearing on many TV drama, movie, anime and manga works very often. 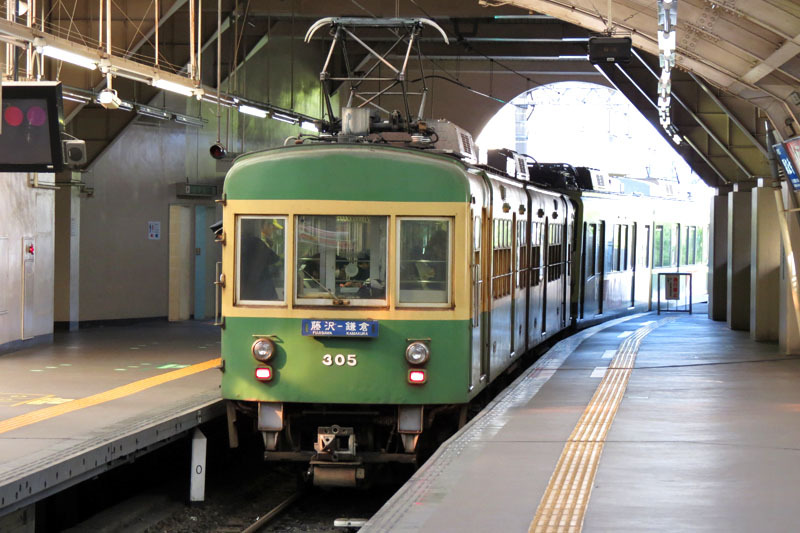 It is sure that riding on the train will become one of highlight for trip to the area. 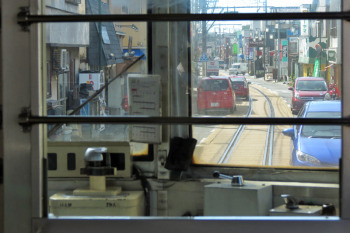 The train is operated every 12 minutes to each direction, except for early morning and late night. 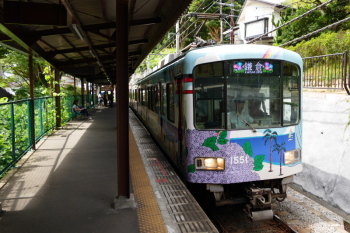 It takes 34 minutes between Fujisawa and Kamakura. All train stops at all stations. Smoking is prohibited at the station and the train. The door of the train stops near [乗車口] indication on the platform. 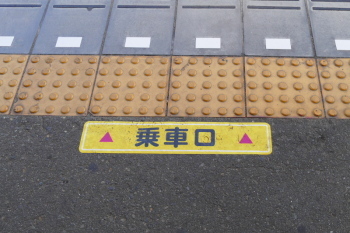 Please line up in the row near here, when you wait and getting on a train. Usually, train is operated with 4 cars. 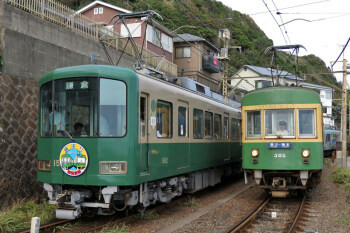 However some trains in early morning and late evening are operated with 2 cars. 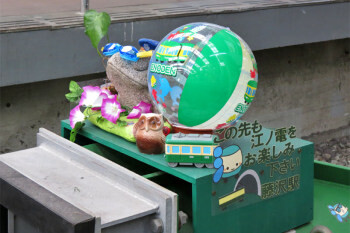 The train may be delayed due to overcrowded in the weekend of summer or the holiday season in Japan. Adult Fare ... 12 years old or older. Children Fare ... Between 6 years old to 11 years old. Infant ... Between 1 year old to 5 years old. Free for charge, up to 2 infants accompanied by an adult. Baby ... Under 1 year old. 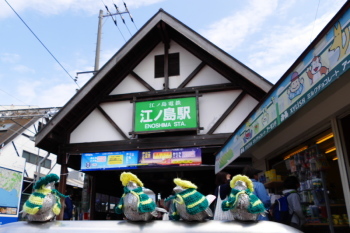 Sold at the counter in Fujisawa, Kamakura and Enoshima station from 13:00 to 17:00. 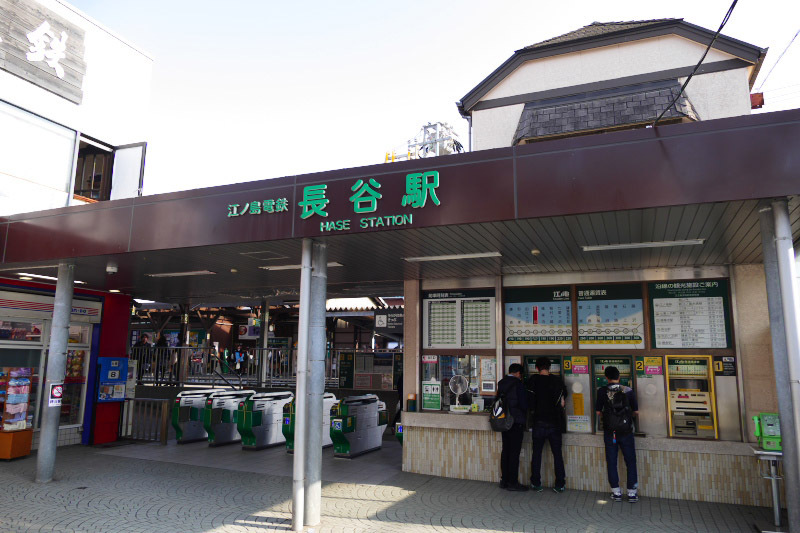 At Fujisawa, Enoshima, Hase and Kamakura station, manned ticket counter also available. 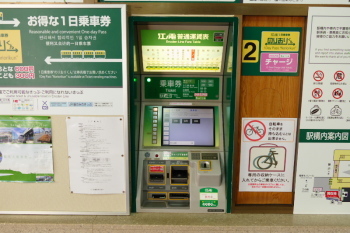 The payment accepts Japanese Yen cash and "PASMO" or "Suica" rechargeable prepaid IC-card. Instructions for using ticket vending machine, automated ticket gate, unmanned station and more..., please see the link How to buy or use tickets at the station in detail. 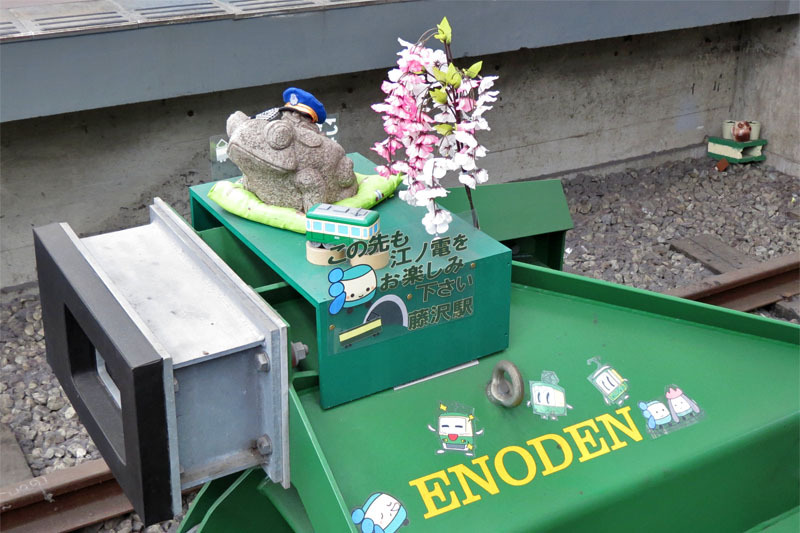 Also available official guide on Enoden Line website. 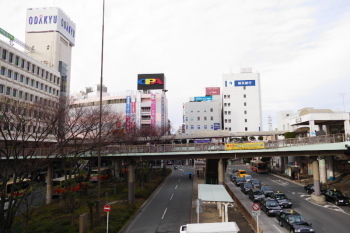 Fujisawa is Enoden's west side of departing station. 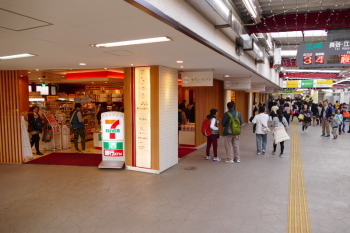 There are many department stores, supermarkets, drugstores and other shops around the station. Enoden's station located at 2nd floor of Odakyu department store on south exit of JR Line & Odakyu Line stations. 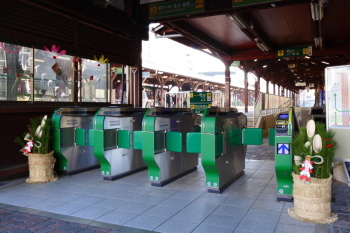 These stations are connected with a pedestrian bridge in 3 minutes walk (200m). 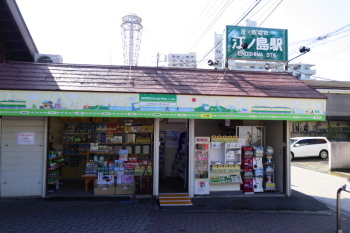 If you need maps or info, there is a tourist information "Shonan Fujisawa Concierge" located on the way (at 2nd floor of JR Line & Odakyu Line stations). JR Tokaido Line: for Yokohama, Tokyo, Shinjuku, Odawara, Atami and etc. Odakyu Line: for Machida, Shinjuku and etc. 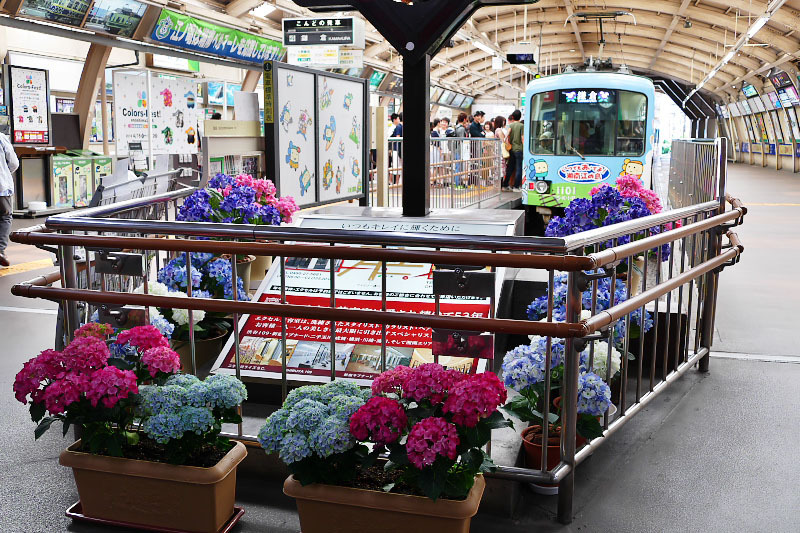 At inside the station, flowers in season or hand-crafted decorations are often displayed and welcomes you. 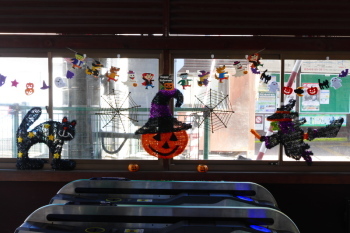 Since such activities are active in the train company, you can find a variety of decorations in some major stations. 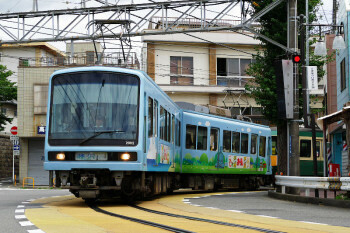 Train departs in every 12 minutes except for very early morning and late night. 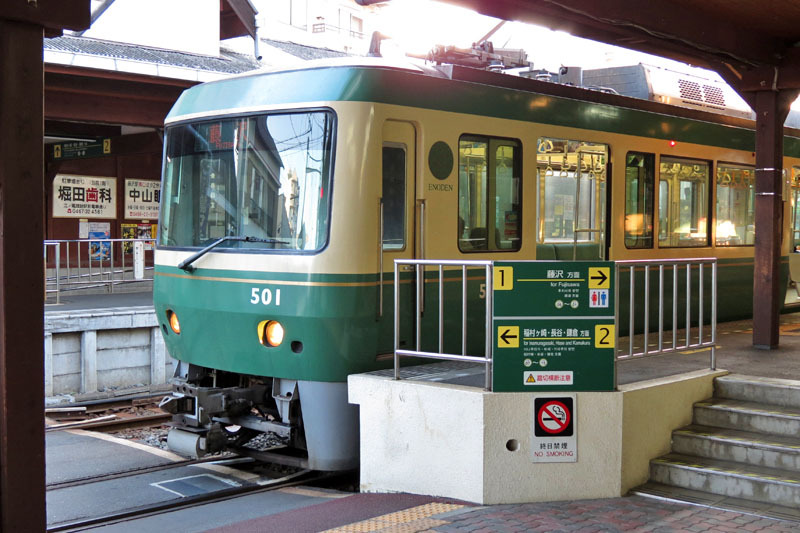 Normally train runs from 5:10 a.m. to around 0:00 a.m. But it runs overnight on 31 December. You will find a frog on the dead end of railroad at the platform. 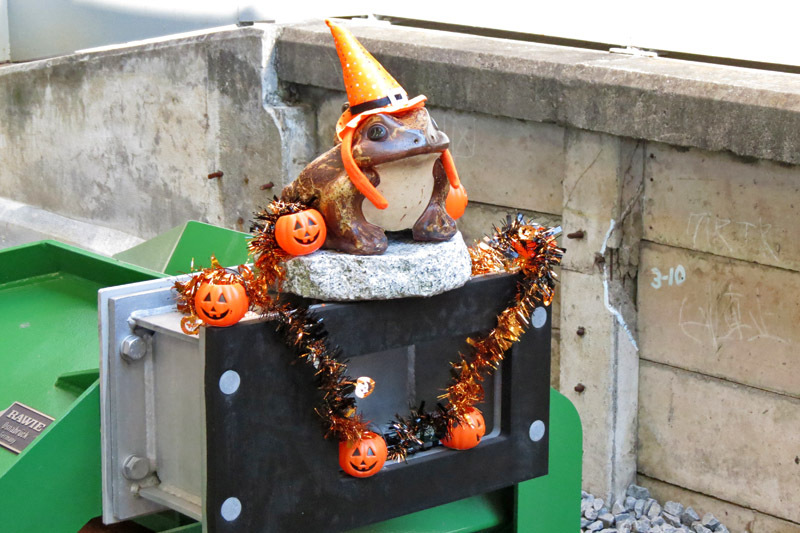 Frog called as "Kaeru" in Japanese, and the word "Kaeru" also has a sense that return safely. This frog is enshrined in the hope for passengers return home safely, is decorated with each seasonal tradition by the station staff. 6 of 15 stations are unmanned, however it is possible to communicate with staff in another station by the intercom when you are in trouble. To wait for oncoming train, train stops longer in every 2-3 station. 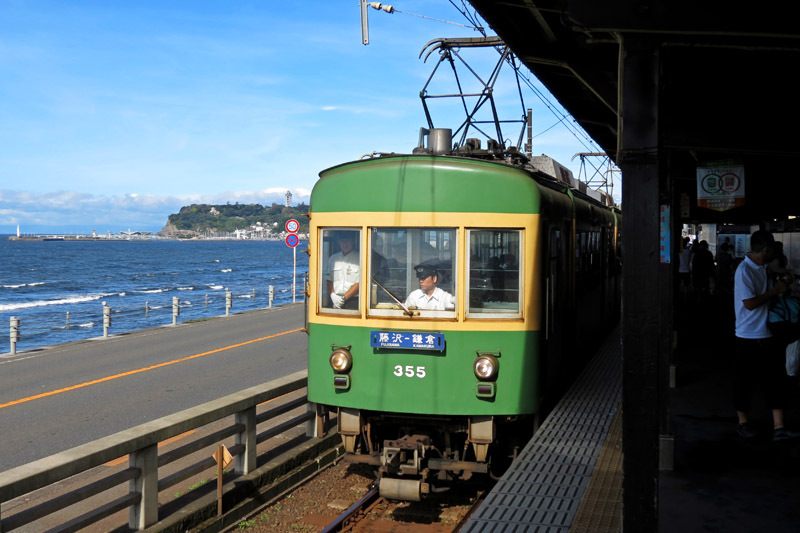 About 10 minutes run from Fujisawa, the train arrive Enoshima Station. 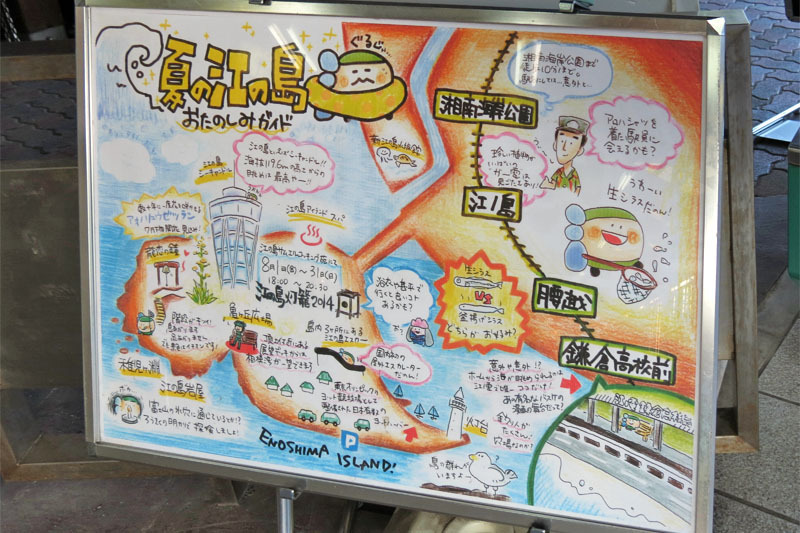 Here is the nearest to Enoshima Island among the line. The station is very crowded with tourists at the daytime of the weekends and the holidays. 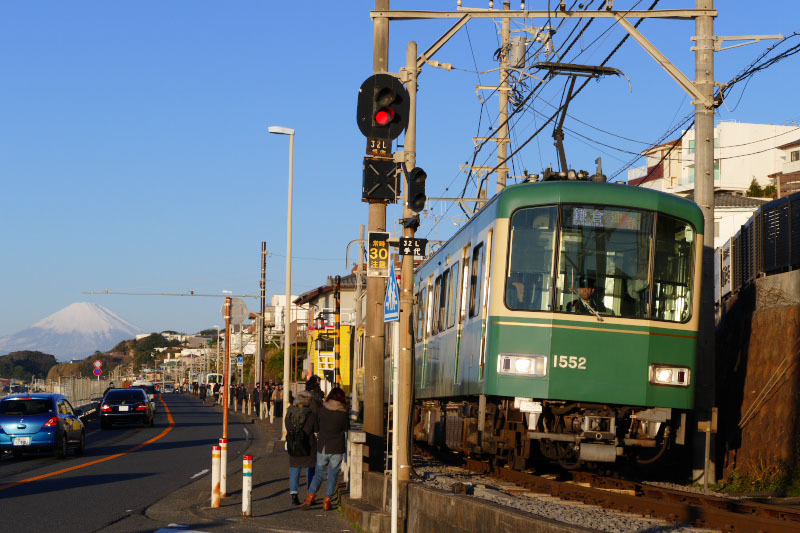 If you go to Enoshima Island and Katase Beaches, walk the road in front of the station to the left about 10 minutes. 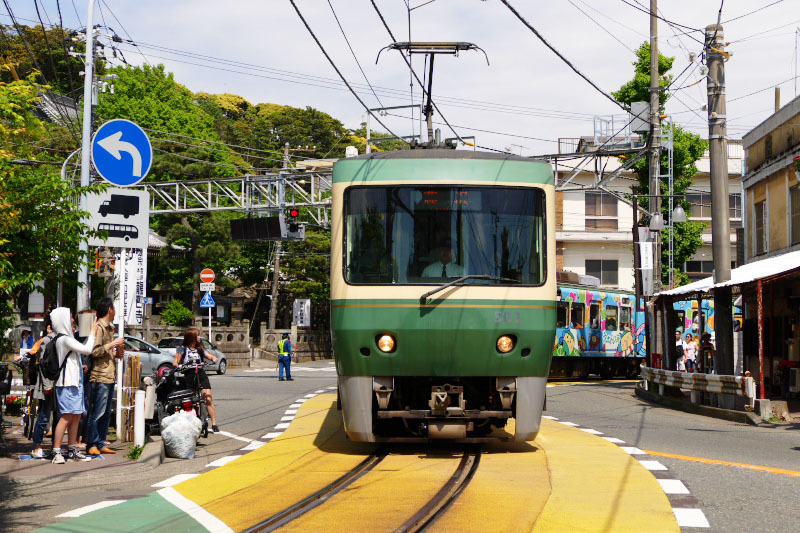 If you go to Ryukoji Temple or Koshigoe Shopping Street, walk the road in front of the station to the right then turn right again about 5 minutes. There is a waiting room on Platform 1. 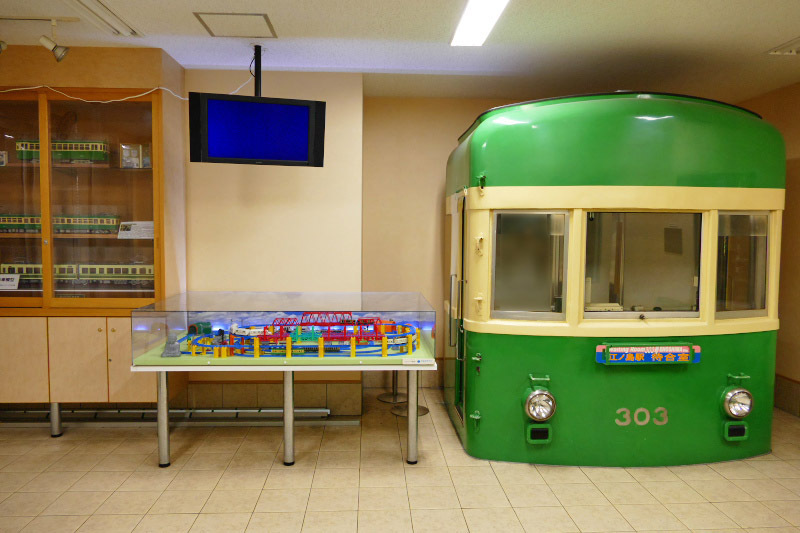 Here becomes like a small train museum, and some documents or models or a real head part of retired train (Type 300) are displayed. 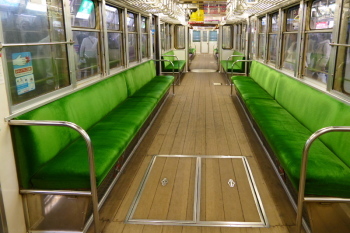 This train was operated until 2007 and we can see outside only. However, there is a chance to enter inside in very rare cases. 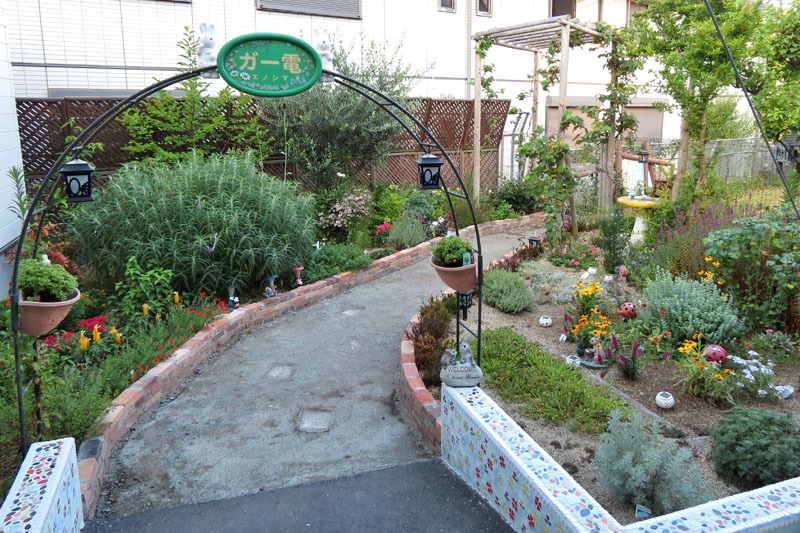 And there is a small garden named the "Ga-den"[ガー電] aside of this waiting room. 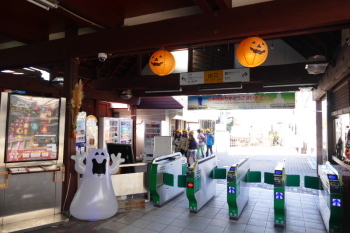 This Enoshima Station is really often decorated with seasons items or event items. During Halloween, inside of the station is fully decorated with lanterns, balloons and ornaments. Jack-o'-Lantern and ghosts appears everywhere at the station!! It's truly rare sight at the public space in Japan, it might be one of the place enjoying this event. 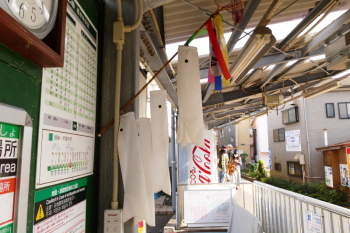 Another rare sight of traditional Japanese new year decoration at the station. "Kadomatsu" displayed in front of the ticket gate and lion dance-"Shishimai" dancing. Enoden staff can realize the old tradition meets modern technology! 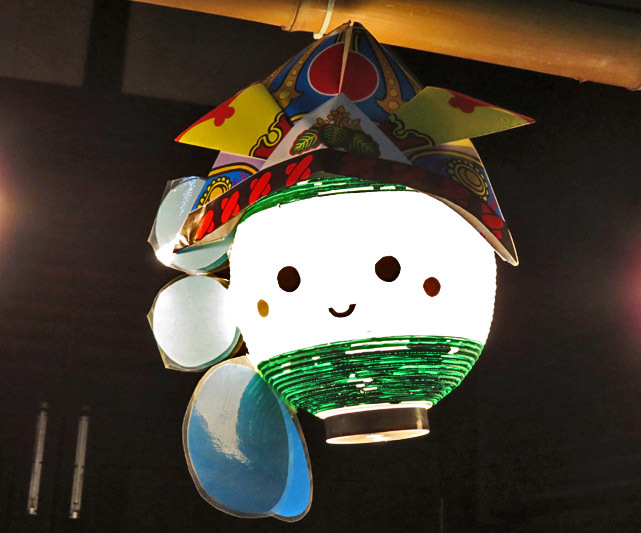 "Kadomatsu"(made of pine and bamboo) is a Japanese traditional decoration in the New year. 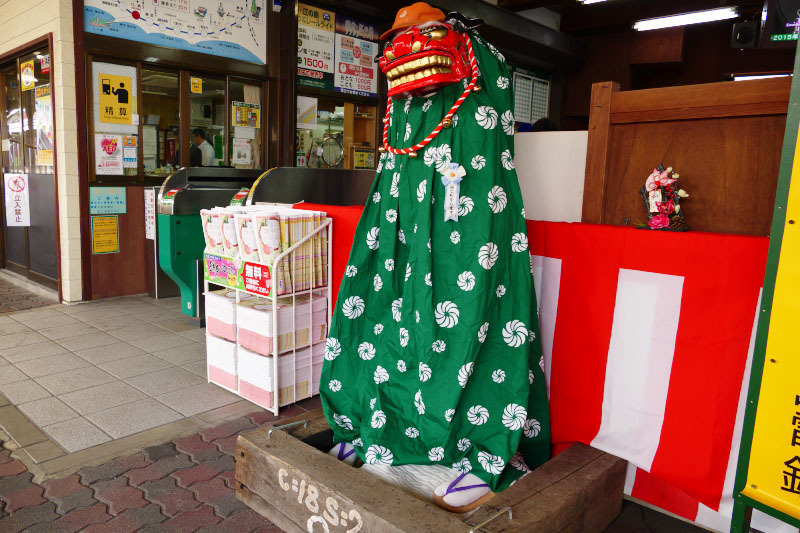 "Shishimai" lion dance is also Japanese traditional scene in the New year. 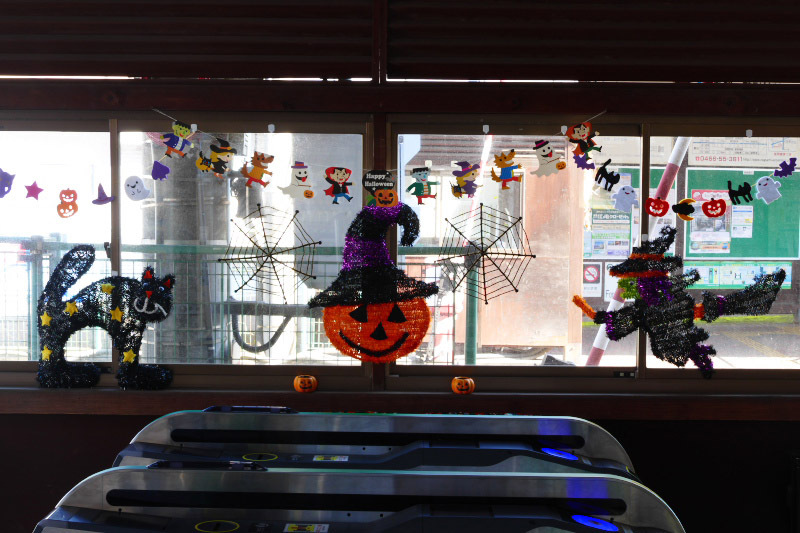 Decorations are not only inside Enoshima Station! 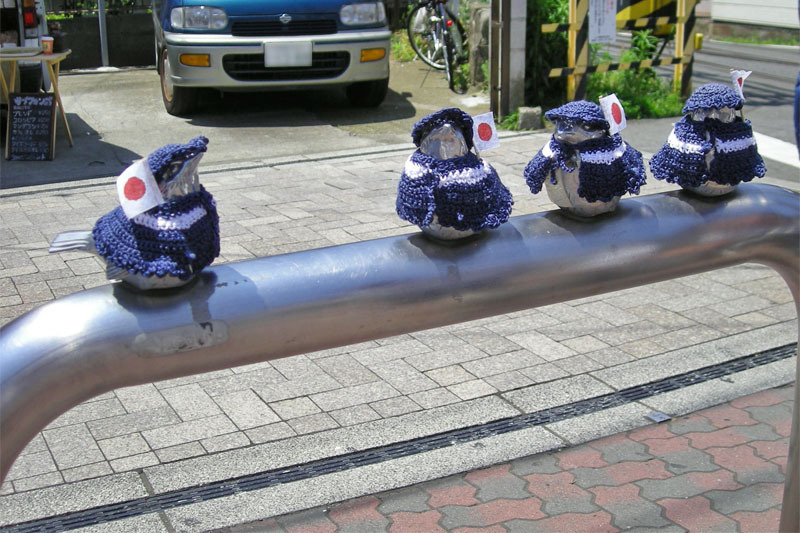 A fence in front of the station is well-known countrywide by its cute appearance. Small birds are dressed up with hat and jacket for welcoming you! A person who lives in neighborhood at the station makes clothes and dressed them. Their clothes change with the seasons and events. Don't miss it!! 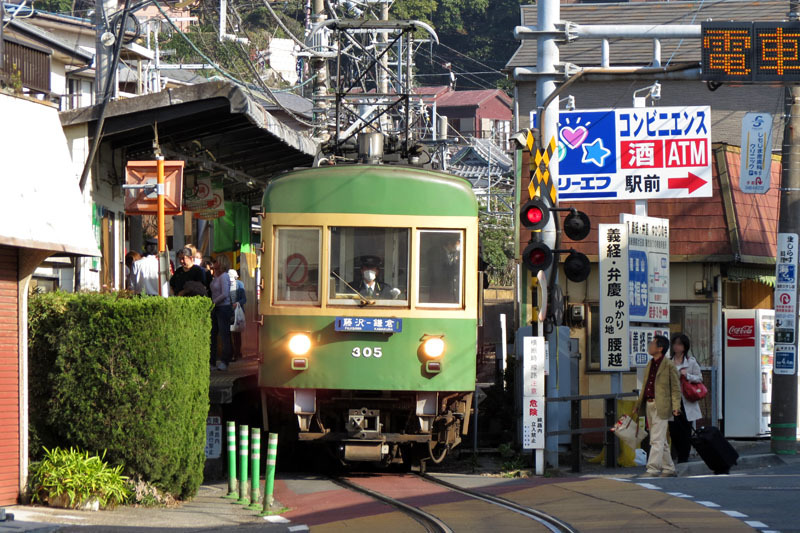 As soon as the train depart Enoshima Station, the railroad merge with the street in front of Ryukoji Temple. 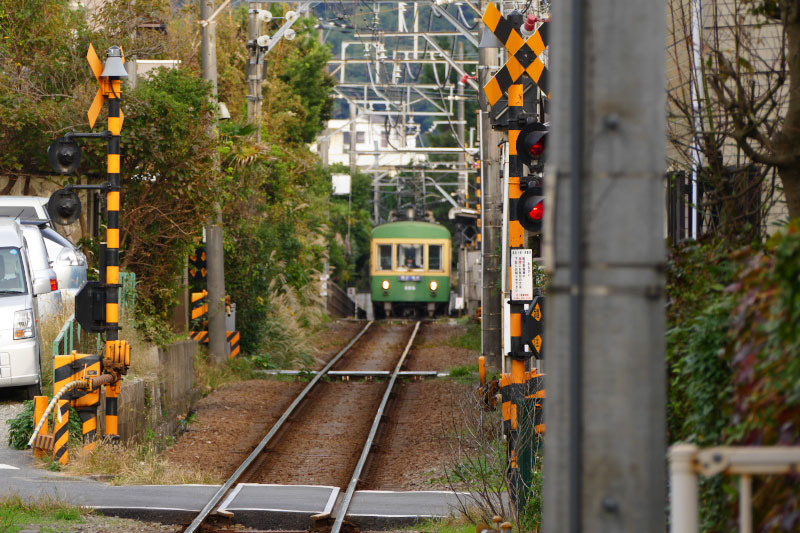 This sharp curve is a radius 28meters and the sharpest curved railroad in Japan. 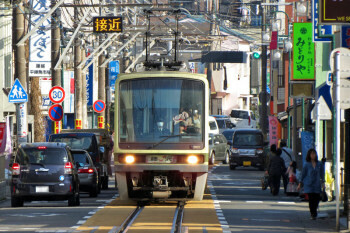 Then, the train runs center of the street along with cars until Koshigoe Station. This street is well-known place for photographers because it is able to see rare scene that a standard train runs along with cars (not a tram!). 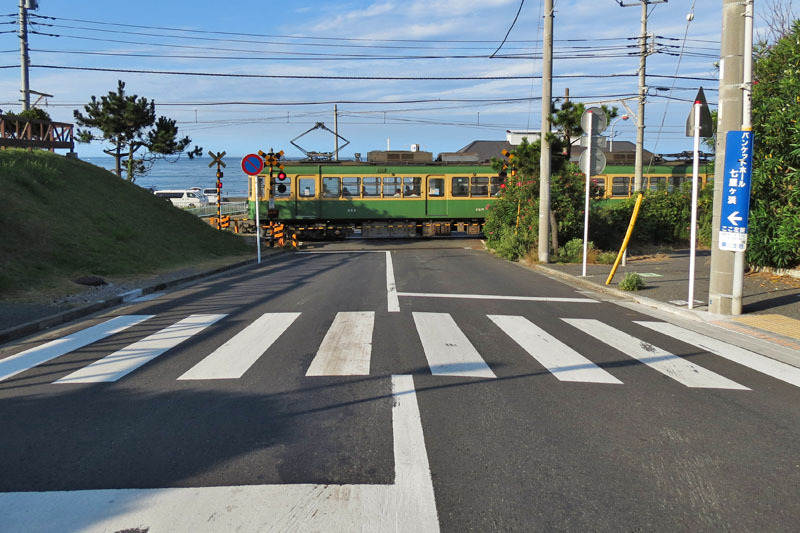 When the train approached, cars have to stop and give way to the train in this street. 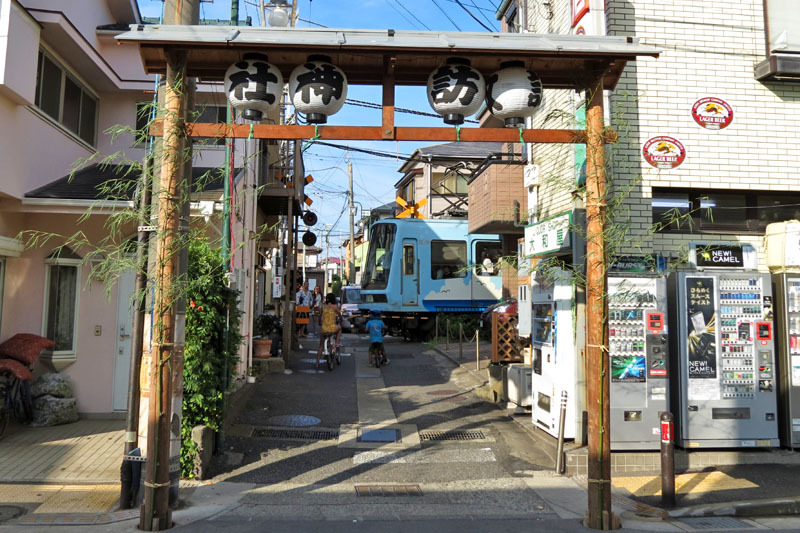 If you have enough time, because of there are some good restaurants and sweets shops, it is recommended that you walk this street while seeing the train. 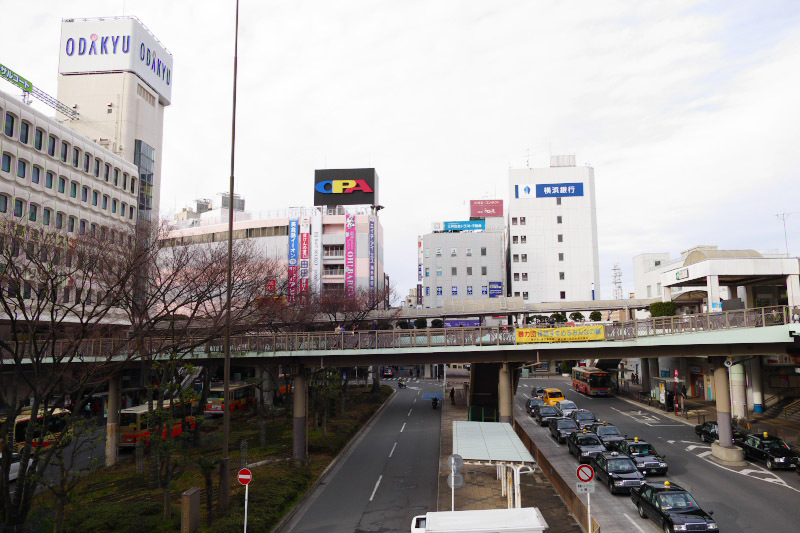 Cars are closed traffic when local festivals is held in this street. 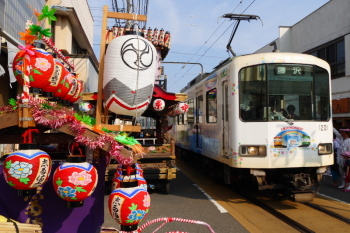 It is a rare chance to see the train passes very near "Dashi" a traditional wooden festival float. On Tennosai festival to be held in the weekend of mid-July, train operation is temporarily suspended 2 times during the peak time of the festival. Because there are too many people in the street and hard to keep safe operation. If you meet in this scene, we strongly recommend that you have to get off the train at the next station and should return here to watch it!! 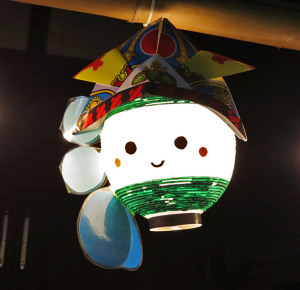 It's really worth to see and able to feel the spirit of Japan! More detail info of the street, please see Koshigoe tourist spot guide page. More festival scenes in the street, please see Yoshitsune Matsuri Festival and Tennosai Festival page. 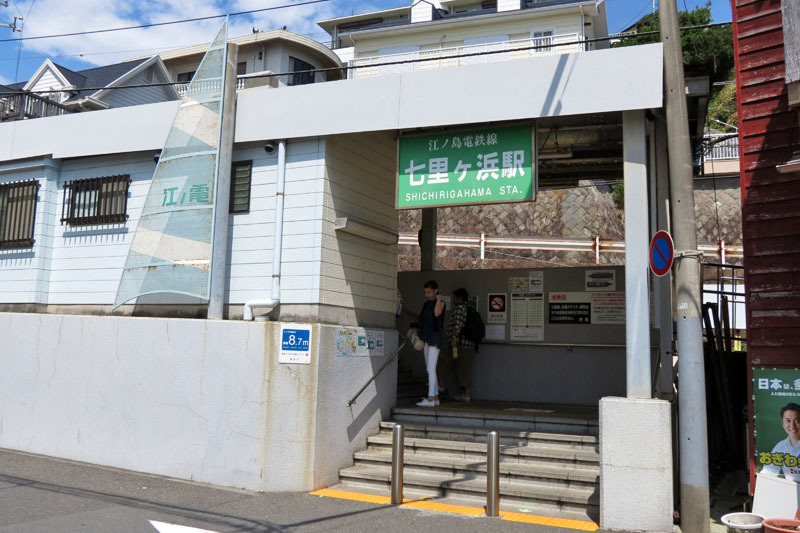 Koshigoe is the smallest station among the 15 stations and also west end station in Kamakura City. Here is also known by interesting decorations such as hand-painted mural on the wall of the station, message board and Shirasu-Nobori(whitebait streamer) made by station staff. Koshigoe Shopping Street, Koshigoe Beach, Manpukuji Temple. 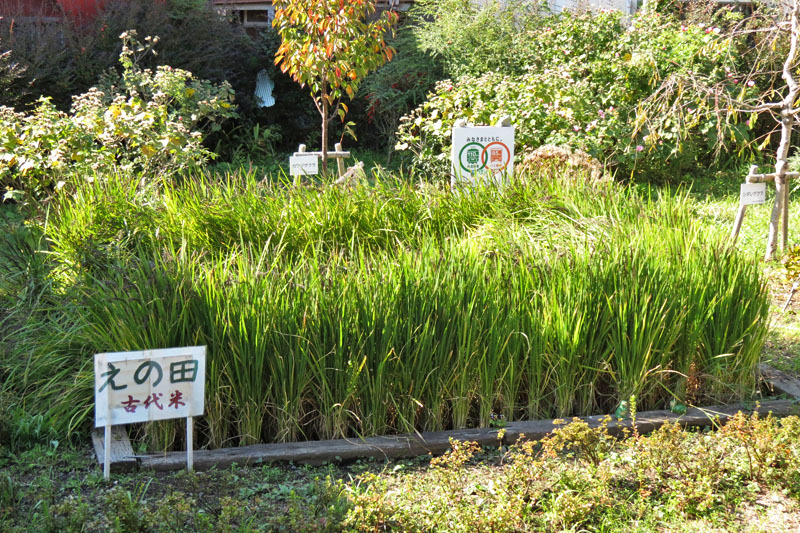 Please see more detail info on Koshigoe Tourist spot guide. 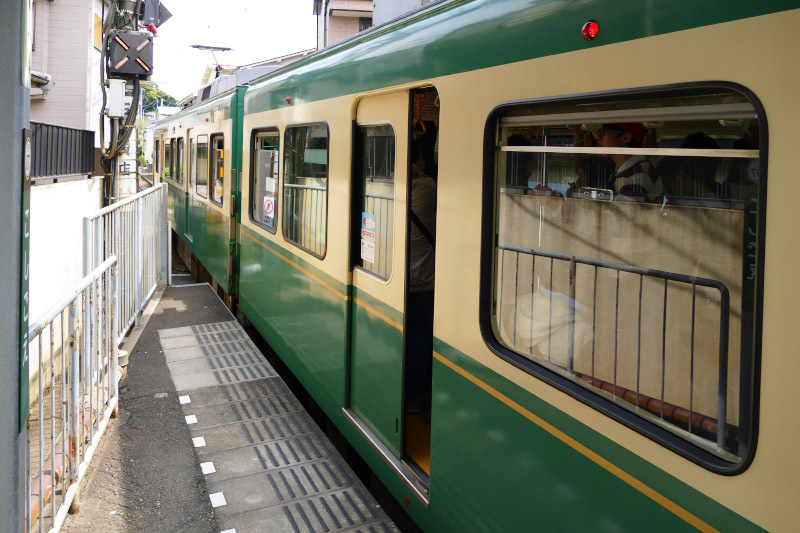 When the train operated with 4 cars, 1 car stops at outside the station. 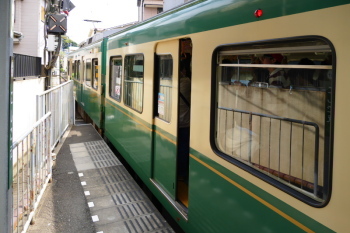 So this 1 car is remain closed the door despite while stopping at the station. 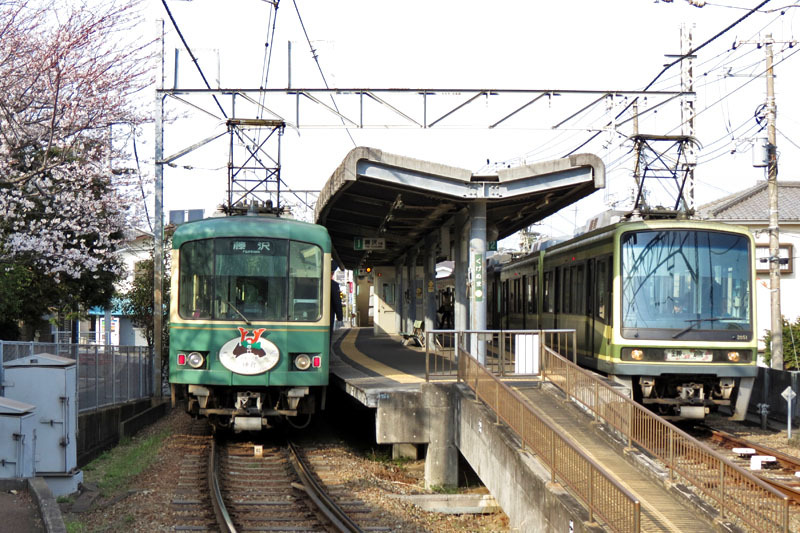 Please pay attention if you will get off at Koshigoe. 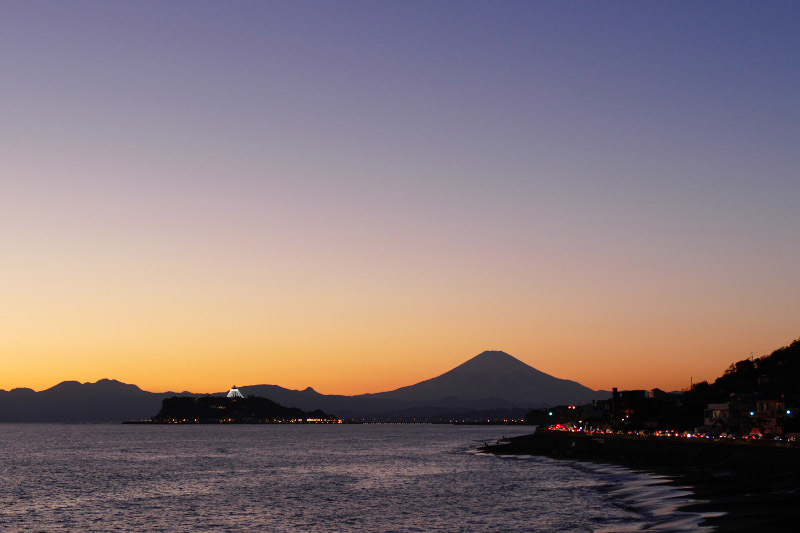 A few minutes walk from Koshigoe Station, you can go to the seaside and can see beautiful sunset with Mt. Fuji from here. 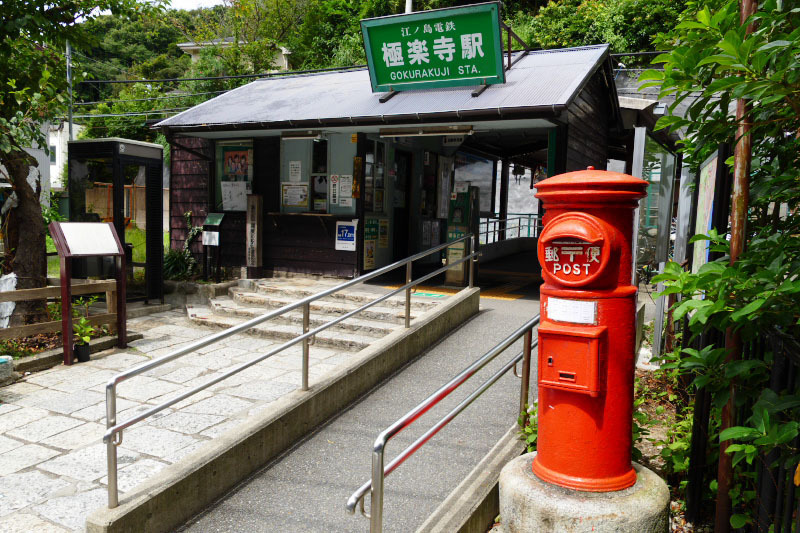 You can also walk to a historical place in the town, Manpukuji Temple. 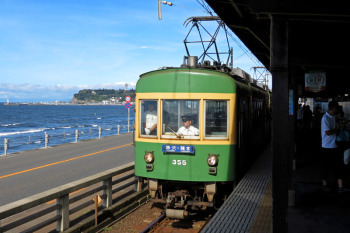 The train runs slowly from Koshigoe Station to seaside. 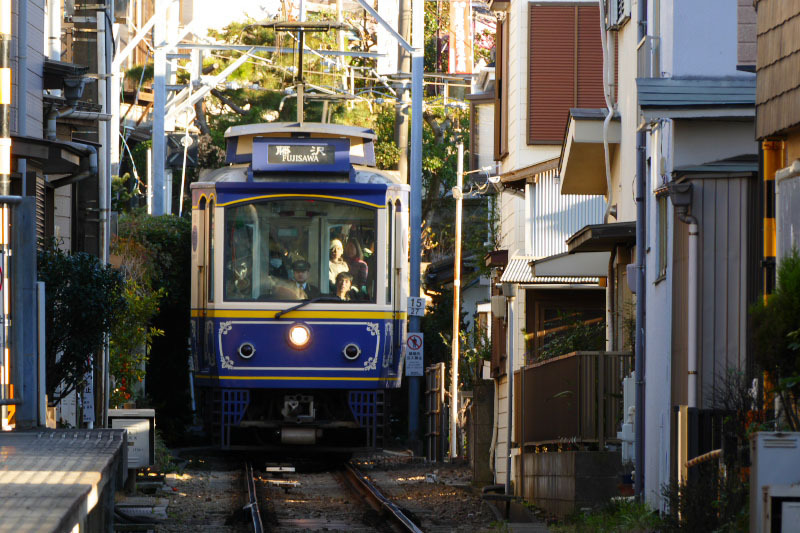 Because here is very small space between railroad and surrounding houses. 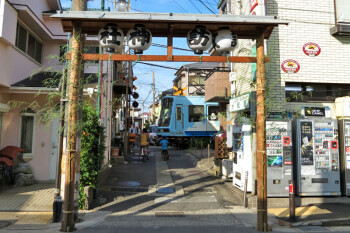 Entrance of some houses in the area are facing on railroad and walk the railroad to go in and out to the houses. Also sometimes, the branch of the garden tree may hit the train window. 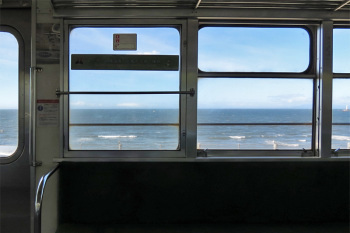 At the same time as the outside of the train windows becomes bright suddenly, the vast ocean and the sky spreads all windows of train. 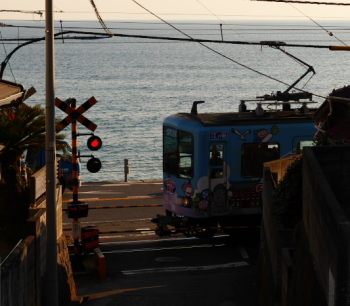 Then the train runs pleasing seaside while increasing the speed. 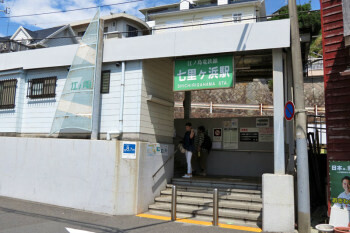 Kamakura Koko Mae Station might be the most famous station of Enoden Line. Because it is appearing on many TV drama, movie, manga and anime works very frequently. 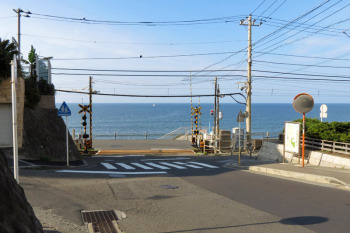 Station itself, Slam Dunk Railroad Crossing, Seaside. 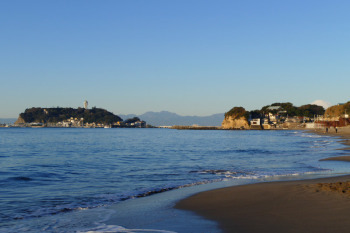 Please see more detail info on Kamakura Koko Mae tourist spot guide. 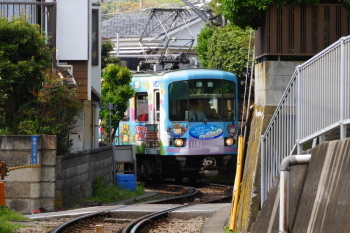 Originally, it is a small station of the residential area only nearby there is a high school, a hospital and seaside. 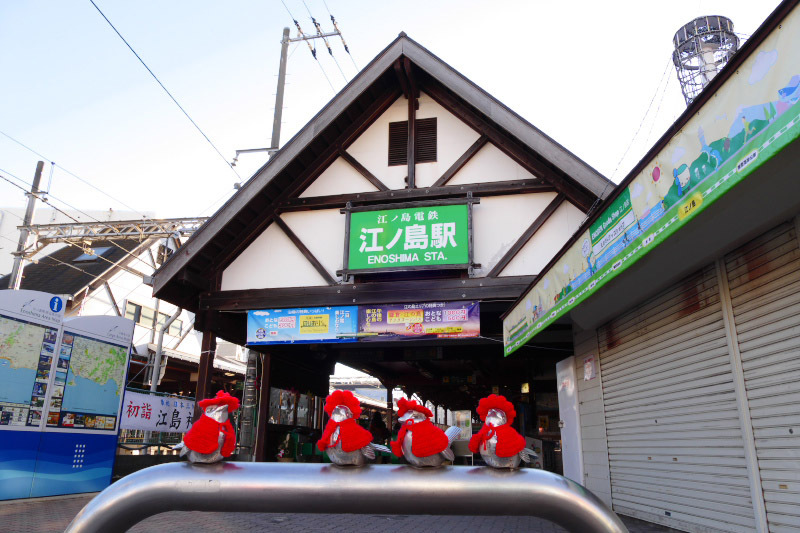 However, from the splendor of the view of the station and the atmosphere of classical small wooden station, it appeared on many stories and came to be known worldwide. Also there is a railroad crossing near the station that called as "Japan's most famous crossing to the world". 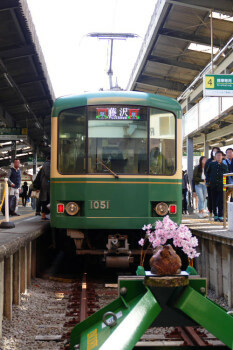 The train run a while after leaving Kamakura Koko Mae station, it stop at nothing place to wait and pass oncoming train. 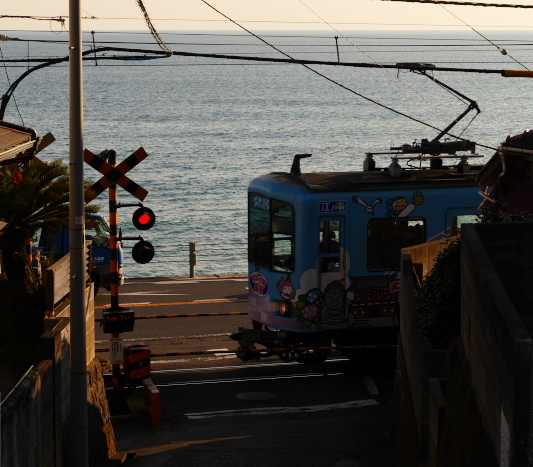 Then, run again for a while from there, the train away from seaside and running along the road. There is no fence between railroad and the road. 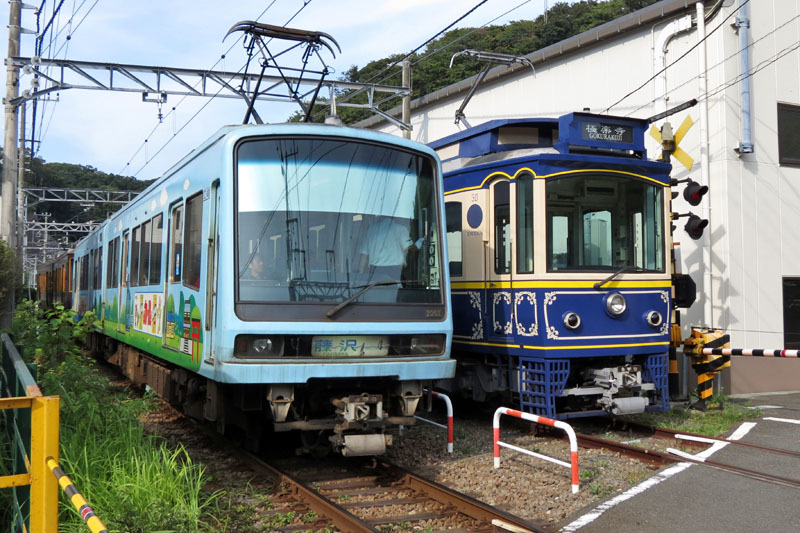 It is also rare sight in Japan. Shichirigahama Station is also in a seaside residential area. 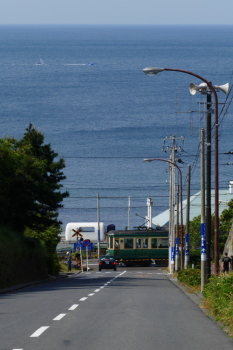 In front of the station, there is a object which shaped the sail of wind surfing. 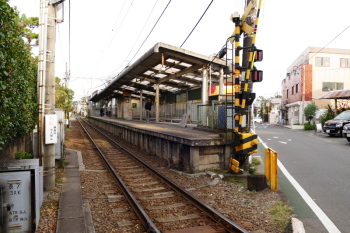 There are some shop and a high school around the station. 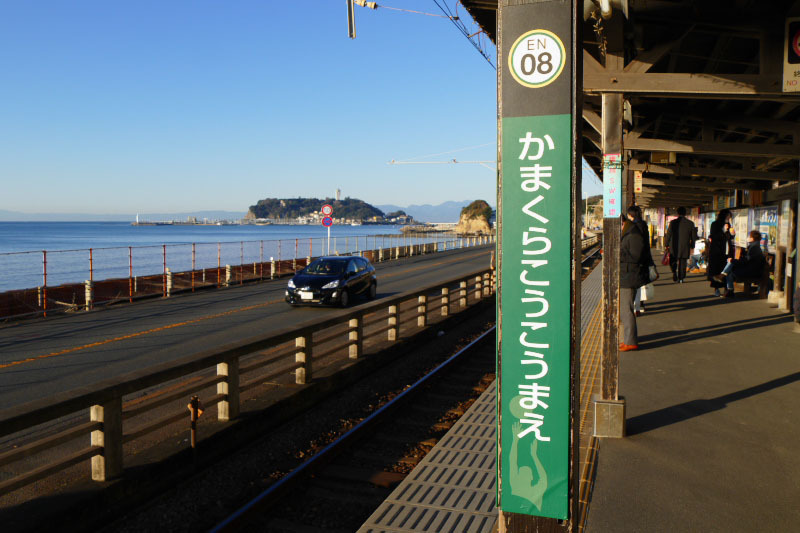 Shichirigahama is a name of near coast, and you can go by a few minutes walk from the station. The train departed Shichirigahama Station, towards the seaside while curve to right and left. Came by the seaside, Train run while seeing the sealine of Shichirigahama. 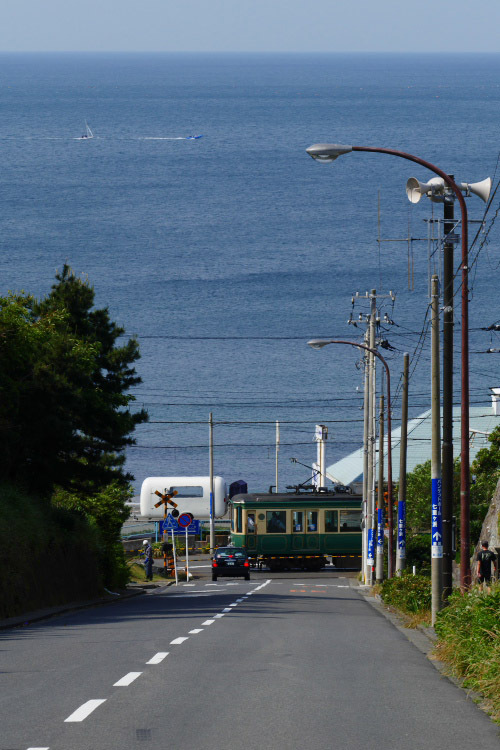 Inamuragasaki is a name of near cape. A few minutes walk from the station, you can go seaside. Park in Inamuragasaki Cape is famous place where you can see the beautiful sunset together with Mt.Fuji and Enoshima Island. 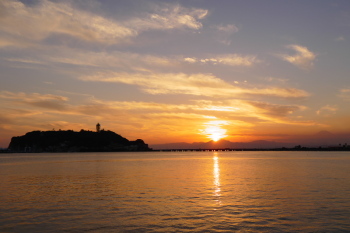 Many travellers and photographers visit here to see sunset on sunny evening. 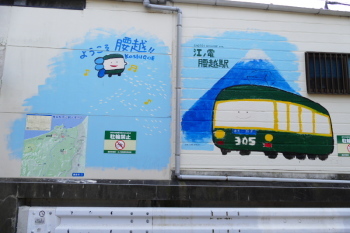 The train away from the seaside and run a while in the mountains. 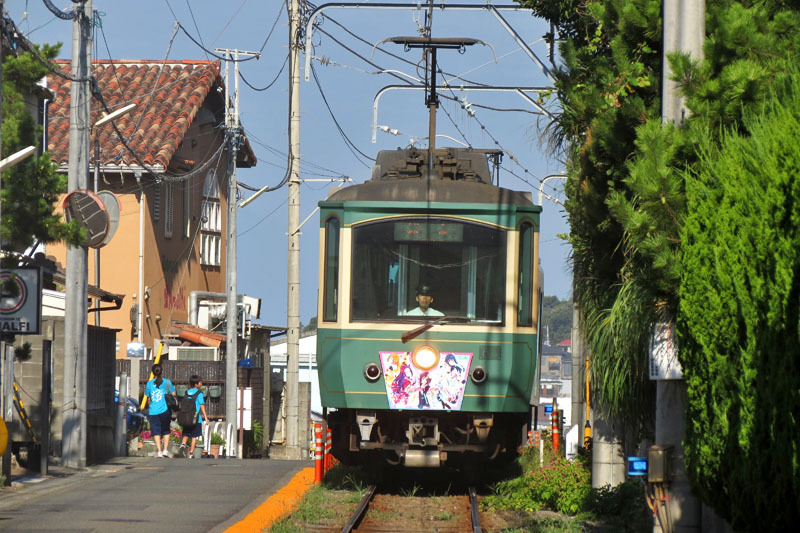 Then, it will arriving at Gokurakuji. The station is small, old and tranquil but it often appeared on the TV Dramas, Movies, Animes, Mangas and Novels as a location. 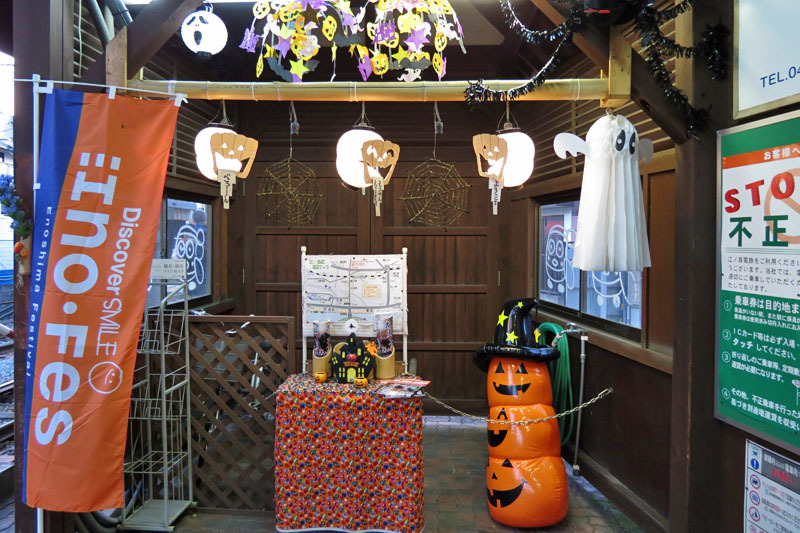 Tourist Spot and Attractions: Gokurakuji Temple, Jojuin Temple. There are some famous tourist spots around the station, such as Gokurakuji Temple and Jojuin Temple. 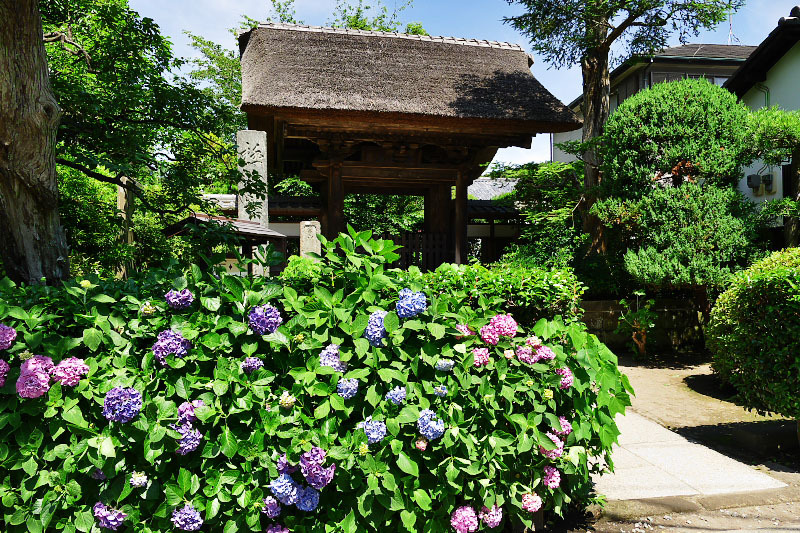 Both temples are known for hydrangea flowers in June and July. 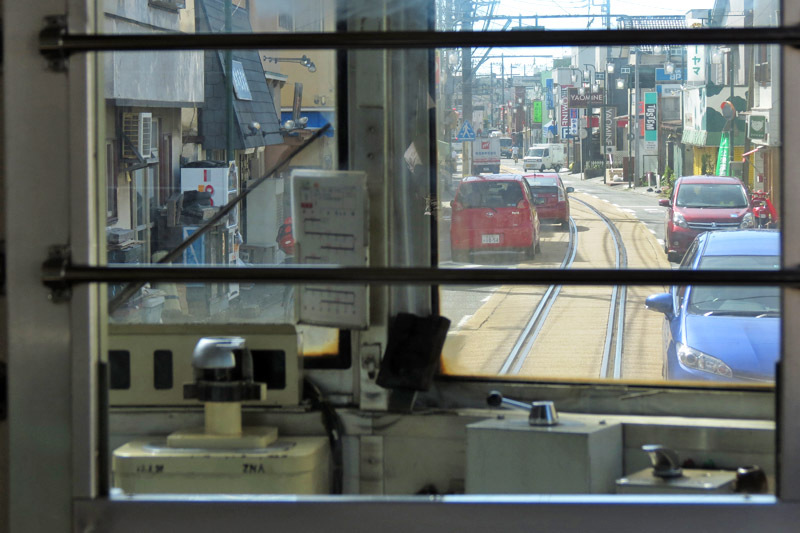 A few minutes walk from the station, there is a train garage. 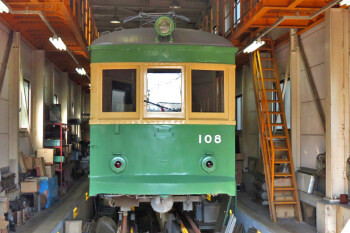 A old train that was used since 1931 also has been preserved here. 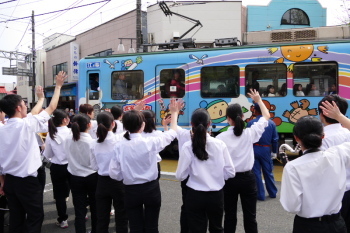 This called as "Tankoro" train is not shown for public normally, but it displays at the event that takes place every December, we can see and ride it at that time. 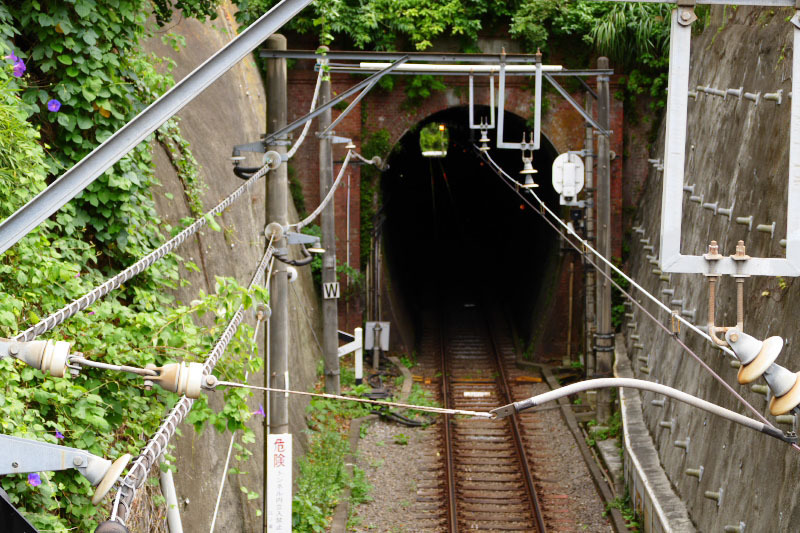 Under the bridge between the station and Gokurakuji Temple, there is the only tunnel in Enoden Line. 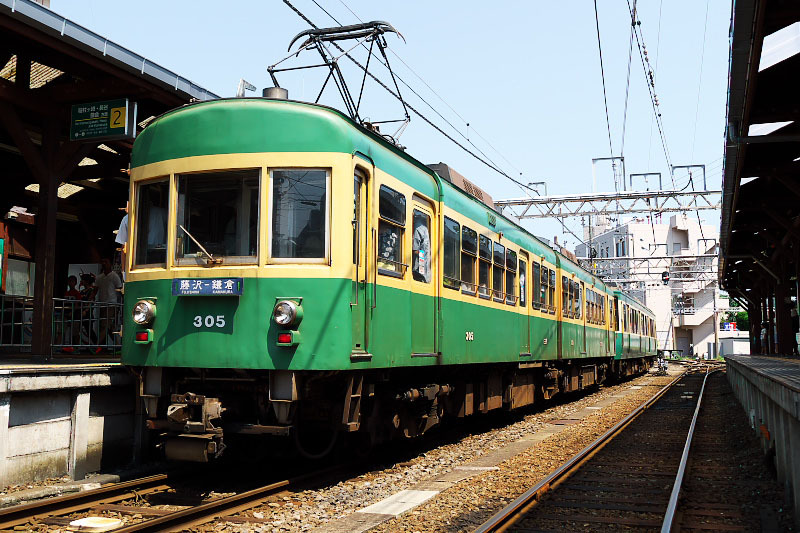 It have passed more than 100 years since construction has been used even now. When the train exit the old tunnel, row of hydrangea trees is followed on both side of railroad. There is a small shrine Goryo Jinja Shrine [御霊神社] known for photography spot of train and hydrangea flower in June and July. 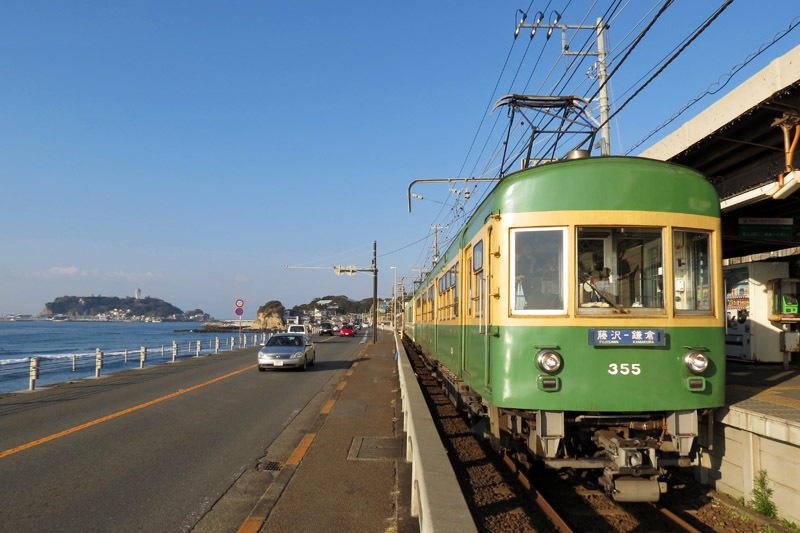 Hase is in the west of Kamakura City and there are many famous tourist spots such as Kamakura Daibutsu (great Buddha statue), Hasedera Temple and more. 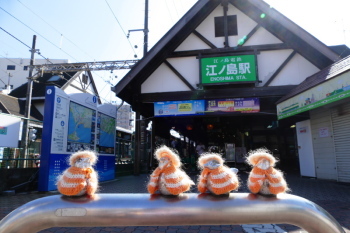 So this Hase Station have been crowded with tourists during daytime. See more detail info on Hase Tourist spot guide. Some temples and shrines in Hase are very famous for Cherry blossom, hydrangea and other flowers. 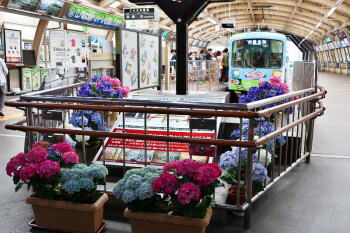 The season when hydrangea flower blooms (from June to the middle of July), it is very crowded with many tourists. 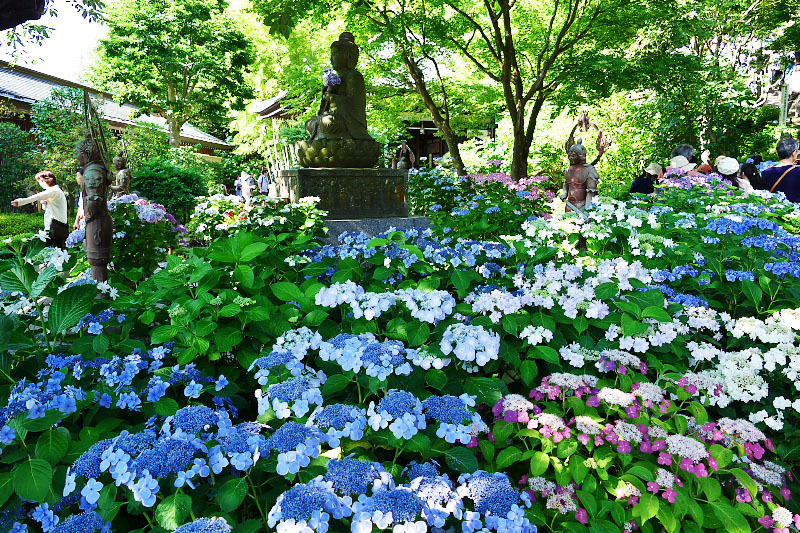 Especially at Hasedera Temple, you may be kept waiting for around 2 hours to see the flower garden in some cases. 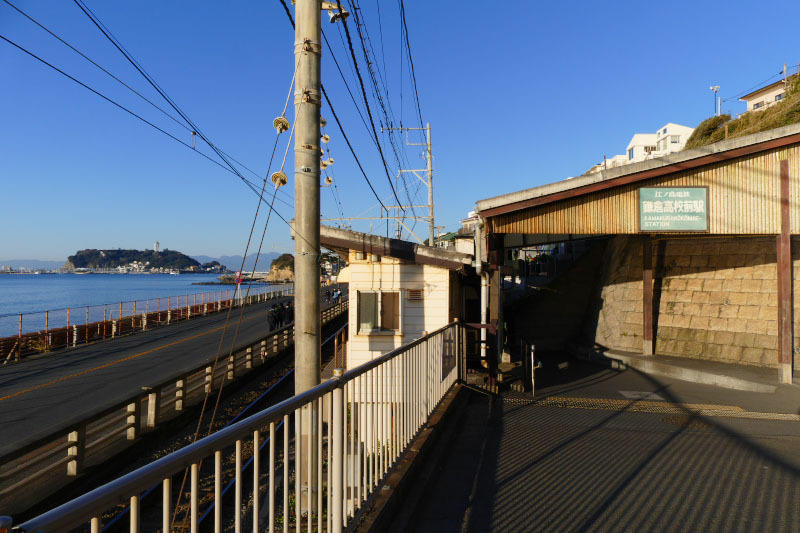 Yuigahama Station is a small station that is in a quiet residential area. 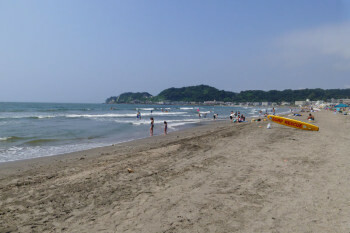 But during the summer, it is very crowded with a lot of young people who visit nearby beach. 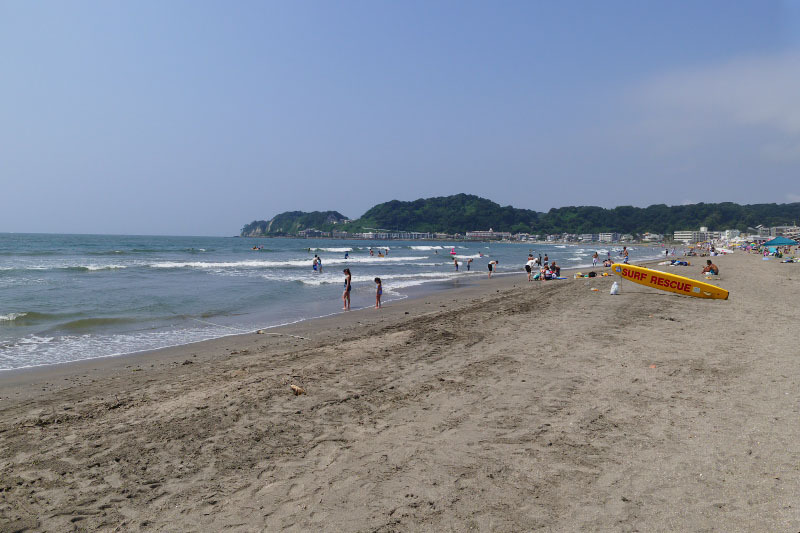 Yuigahama Beach has a wide sandy beach and close to the center of Kamakura, also known be to open a number of seaside resthouses and restaurants during the summer. 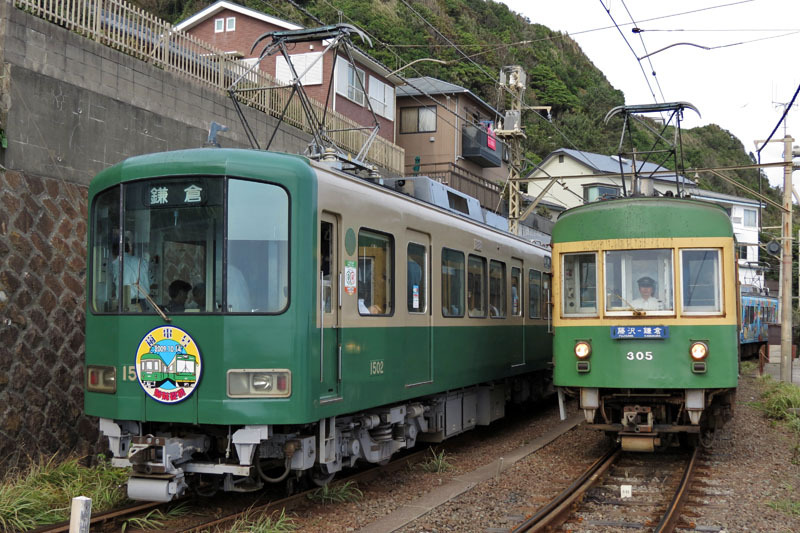 Kamakura is well-known as Japan's historical tourists destination and also Enoden's east end station. 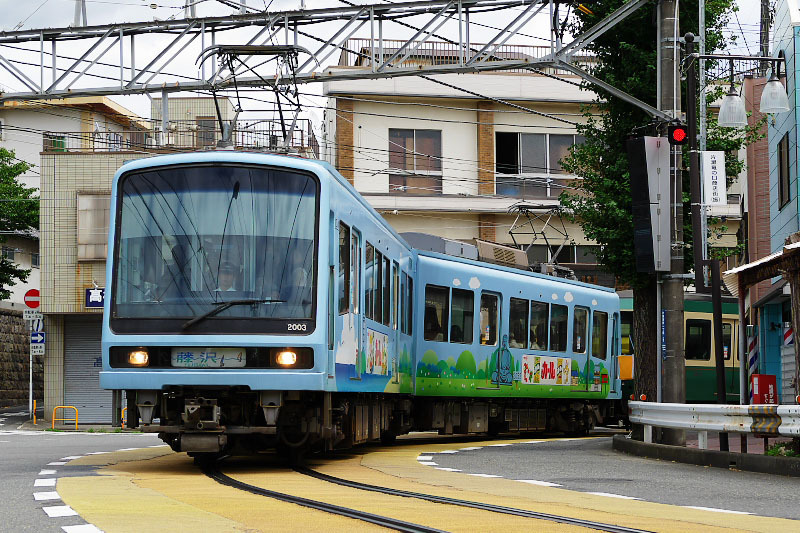 It is possible to transfer to JR Yokosuka Line for Yokohama, Tokyo and Yokosuka direction. 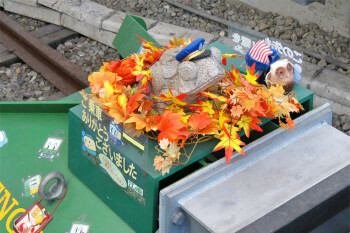 There is a frog in the end of railroad also in this station. Habit of decorate a frog figurine began from here. A rice field is aside of station platform and cultivates rice. 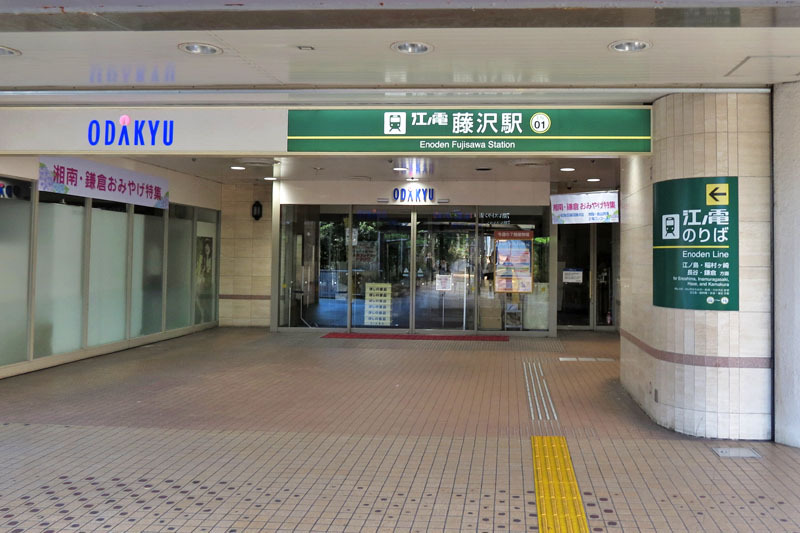 Temporary luggage storage service offered by Kamakura City tourism association on the 4th floor of the building next to the left of Enoden Line Station exit. 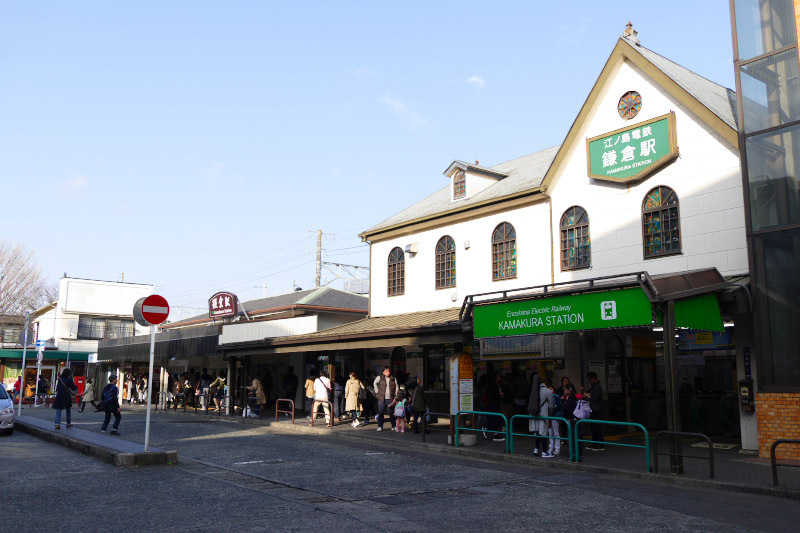 In Kamakura Station, there is a large souvenir shops between platform and ticket gate. 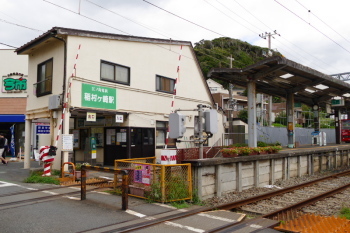 This Enoden station located in West Exit [西口]. But most of famous tourist spot such as "Tsurugaoka Hachimangu Shrine" and shopping spot "Komachi-dori Street" are located in opposite East Exit [東口] side. or pass through JR Line station by your Enoden Line ticket, One-day Pass and PASMO or Suica IC-card. How to do it? Please click above link that the type of ticket you use. 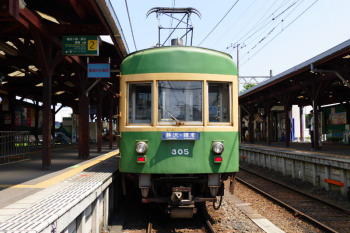 This old and nostalgic train is not only symbol of Enoden, it has also become an icon of Enoshima and Kamakura. Since its birth in 1960, more than 50 years have continued running the area, and it appears on TV, movie, anime and etc. very frequently. 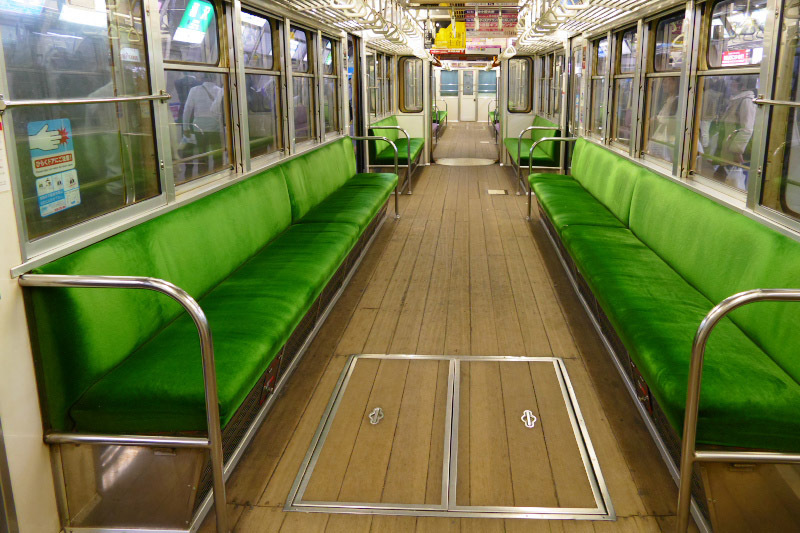 It had some renovation such as installation of air conditioner, but basically it keeps old style like wooden floor. 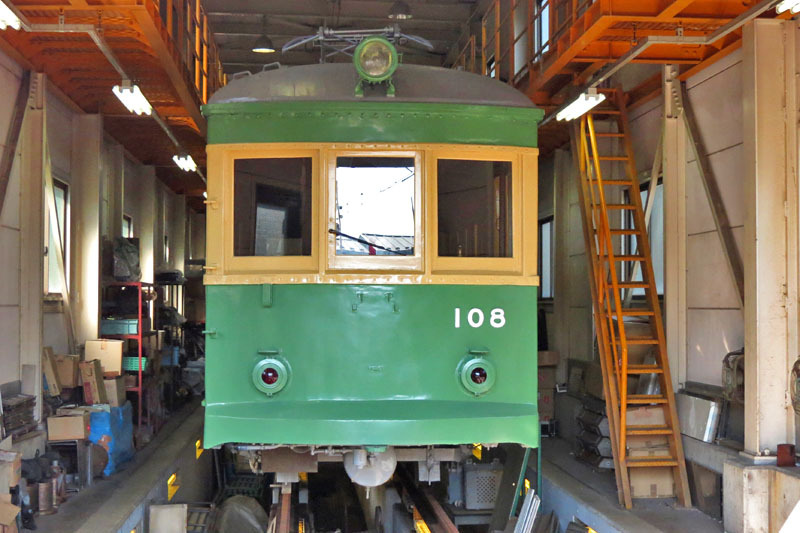 Although this train is only 1 unit, you have a chance to ride and see it almost daily, except for maintenance day approximately once a week.